Score traffic and revenue with a giant prize football promotion from Odds On Promotions. Check out these fun and affordable insured prize ideas! 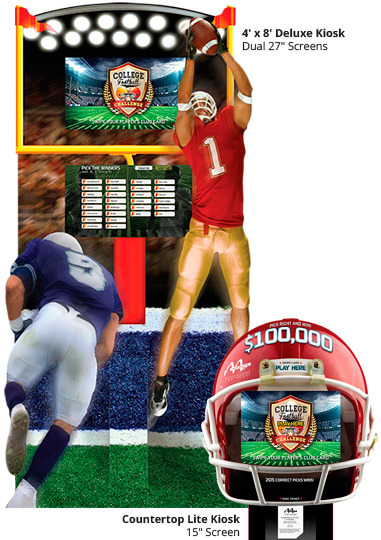 Extend your Pro Football Challenge daily traffic all the way through Super Sunday! Customers get one free chance per day, Mondays-Fridays, to pick the winners of the upcoming playoff games along with various prop and fantasy type questions applicable to those games. Add up to a $100,000 insured prize and bonus plays for coin-in thresholds and watch your football season success skyrocket. The Odds On Promotions’ College Football Challenge game is a fun, easy and fully-automated “pick ‘em” style football promotion. Players simply swipe their card, make their picks, and collect a receipt featuring their own weekly picks, prior week’s results and year-to-date standings.